Rice Controversy Raises Ayotte's Profile : It's All Politics For many Americans, New Hampshire freshman Sen. Kelly Ayotte is a brand-new face. But she campaigned this year with presidential candidate Mitt Romney and was mentioned as a possible running mate. Now, she has joined veteran Republican senators in raising questions about U.N. Ambassador Susan Rice. 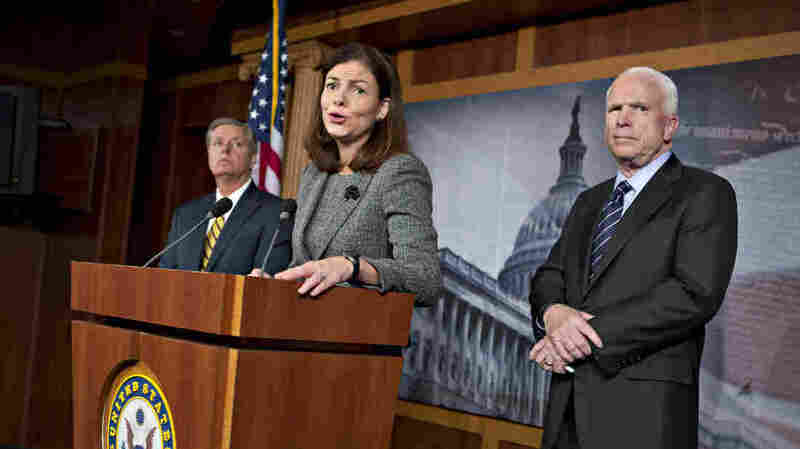 Sen. Kelly Ayotte, joined by Sen. Lindsey Graham and Sen. John McCain, discusses the attack on the U.S. Consulate in Benghazi, Libya, on Capitol Hill earlier this month. Freshman Sen. Kelly Ayotte of New Hampshire has been standing side by side with colleagues John McCain of Arizona and Lindsey Graham of South Carolina in questioning the Obama administration's version of events about the deadly attack on the U.S. Consulate in Benghazi, Libya, in September. It is just the latest in a series of high-profile moments for Ayotte, who is seen as a rising star in a party struggling to win female voters. For McCain and Graham, both longtime senators, the main focus in the Benghazi story has been U.N. Ambassador Susan Rice, and their statements have been getting most of the attention. But they have been joined by Ayotte in accusing Rice of misleading the public in statements she made on television in the days following the attack. The three senators say they are especially troubled that Rice is a leading contender to become U.S. secretary of state. This week, after a closed-door meeting with Rice, the senators emerged unsatisfied. "I want to say that I'm more troubled today, knowing, having met with the acting director of the CIA and Ambassador Rice," Ayotte said after the meeting, complaining that Rice should have called it an al-Qaida attack from the beginning. "Clearly the impression that was given, the information that was given to the American people was wrong." Ayotte speaks at the Republican National Convention in Tampa, Fla., in August. For many Americans, Ayotte, 44, is a brand-new face. Her 2010 campaign was her first run for elective office. But the Nashua, N.H., native was frequently seen this year with presidential candidate Mitt Romney. Ayotte campaigned for Romney in battleground states and on TV, and was rewarded with buzz that she was on Romney's short list of potential picks to be his vice presidential running mate. 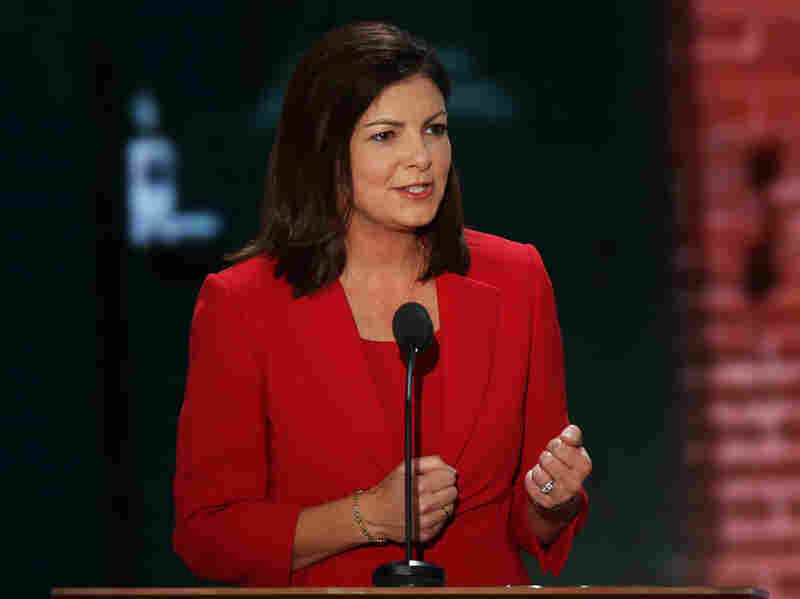 Ayotte was also among the women featured at this summer's Republican National Convention. She has been a fiscal and social conservative. Dante Scala, a political scientist at the University of New Hampshire, says that differentiates Ayotte from two women who represent neighboring Maine in the U.S. Senate. "Back in 2010, that was the comparison: 'Oh well, she's a Republican, she's a woman, and she's from New England, so she's going to be like Susan Collins or Olympia Snowe.' But she took a much different path," Scala says. Ayotte, a former state attorney general, may not be a natural politician, often seeming uneasy during speeches, Scala says. But she is also one of only four women who will serve as Republicans in the new Senate, which will have 16 female Democrats. "I think she can become a real Margaret Thatcher-like voice for us on national security," says Sen. Graham, "and I think Democrats will probably gravitate toward working with her because she is smart." Peter Burling, a state Democratic Party official, has a different view about Ayotte's high-profile role as a critic of Rice. "My initial reaction has been impatience and annoyance," he says. Burling says Ayotte, McCain and Graham are leveling charges that have no basis in fact. Further, he says, Ayotte's very conservative politics are at odds with voters in her own state, where she is the only Republican in the new congressional delegation. "In some ways, she's either made a decision to ignore her local constituency in pursuit of a national place or she is being managed by somebody who hasn't pointed out to her that her voters want her to do something else," Burling says. Ayotte, who is married to an Iraq War veteran and the mother of two young children, faces re-election in 2016. New Hampshire politics make it difficult to predict whether she'll have a lengthy career. But that doesn't dim the current prominence that she's chosen to embrace or discourage talk about potentially larger ambitions down the road.